Recently, the Carolina Beach Music Academy announced their 2016 CBMA Nominations. 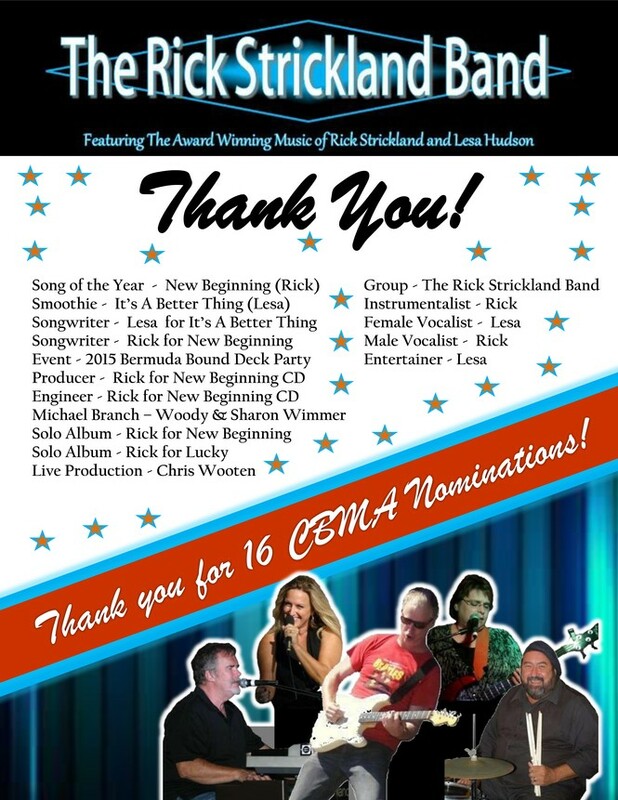 Receiving the most nominations this year is South Carolina based The Rick Strickland Band who was awarded 16 CBMA Nominations. Leaders of the band, Rick Strickland and Lesa Hudson, are nominated in all the major categories including Male & Female Vocalist, Entertainer, Song and Smoothie, Songwriter and many more. In addition the band is nominated for Band Of the Year for the 4th year in a row. See complete list below. For many years now, The Rick Strickland Band (RSB) has been a prominent fixture in the beach music market, performing at festivals & concert series across the Southeast, and entertaining & delighting audiences with their own special brand of beach music. The heart & soul of RSB is the music and personalities of 2 of beach music's most celebrated artists Rick Strickland and Lesa Hudson. Rick & Lesa, along with other members of RSB form an incredible fusion of seasoned musicians & vocalists who easily captivate the hearts of music lovers of all demographics with their well-polished musicianship and winning personalities. RSB features 2 award winning artists & songwriters. Rick Strickland and Lesa Hudson. Rick has been in beach music scene since 1979 working with bands ShagTime & Band of Oz before branching out on his own. He has received 6 CBMA awards and well over 50 nominations. He is credited with penning some of beach music's most beloved hits including Something Smooth, So Do I and She Can't Fix Grits. Additionally he was the musical director for International Recording Artist Billy Joe Royal for 3 international tours. Lesa is one of beach music's top female artists today and has broken several records in her 10 years on the scene. With 6 nominations this year, Lesa holds the most nominations of any other female artist for the 3rd year in a row. Lesa has earned 2 CBMA awards for her musical contributions. Recently, Lesa gained national attention in the Inspirational Country Market, and performed at legendary venues such as the Roy Acuff Theater & Gibson Guitar Café in Nashville TN. Year after year, Rick & Lesa receive nods in all the top CBMA categories. Booking RSB gives your audiences 2 well known award winning artists to enjoy in the same band....at one price! Rick & Lesa collectively have 15 #1 beach & shag hits. There are very few bands or artists in the market today that can claim that many #1 hits. If you follow beach music, then you will know Rick's #1 songs including Something Smooth (which was #1 for the entire year of 2005), So Do I, One Step Closer, She Can't Fix Grits, Party Til The Break Of Dawn, and Lesa's #1 songs Amazingly Amazing, When You Look At Me (the longest running song at #1 in the history of The Surf's Top 20 Countdown), Get Your Feet On The Floor and their duet I'm Hungover, and many more. While their music is very popular in the beach music market, Rick & Lesa's musical catalog is diverse enough to appeal to audiences of all music tastes, including R&B Soul, RockNRoll, Country, Blues and many songs which could play on national radio today. As songwriters, Rick & Lesa do not limit themselves to any particular genres; rather they write the music they know will appeal to their audiences. Rick & Lesa's music is regularly played on beach music radio. DJ's love their music and often keep their songs in rotation for many years. Beach music fans know Rick & Lesa's music because they regularly hear it on beach radio all over the Southeast and internationally on internet radio. RSB is the only band in beach music who successfully writes, produces and performs their own music. They are not a cover band. Beach music fans everywhere, and DJs as well, have welcomed their original music as a refreshing alternative to the status quo. Legendary Beach Music DJ John Hook introduced Rick & Lesa at a recent CBMA show as "The Prince & Princess of their own special brand of beach music called 'Rhythm & Romance!'" Fans routinely travel long distances to see RSB and to hear & dance to Rick & Lesa's music, because they know it will be a truly unique one of a kind experience. Shaggers often say that they typically prefer to dance to DJs, but RSB is the only exception because their music is dance-able, and their live performances are tempo-ed perfectly due to their capable musicianship. Line Dancers, Ballroom Dancers, West Coast Swing Dancers....you name it....they all love to dance to Rick & Lesa's music. You don't have to worry whether people will dance at an RSB show. It's a fact...they will dance. They will be entertained. And Lesa isn't shy about getting out there and dancing with folks either! - "My first time seeing RSB perform, I was blown away at how many killer songs they have written!" - "I've seen many other bands all who performed the same list of cover songs, and RSB is so refreshing with their original music and talent! I'm a fan for life!" - "RSB's vocals & harmonies are the BEST in the business. Nobody can touch them." - "If you want a truly unique musical experience for your event, The Rick Strickland Band should be at the top of your list!" - "We don't normally enjoy dancing to live bands, but The Rick Strickland Band is the only exception!" - "The Rick Strickland Band stands on its own in a market where conformity is often celebrated." - "The band's winning personality & charisma on and off stage makes them relatable to audiences of all demographics." - "As a beach music DJ who works with all the top bands, I always look forward to working with RSB the most! I never have to worry about whether I'm going to play the same songs at the break that they're going to perform. I get to play all the great songs by the original artists, and then RSB takes the stage and blows them away with their incredible original beach music. Makes for the best kind of event in my opinion."